Airlines, Best Meals, Fish, food, Transport - planes, trains and automobiles, Travel - bon voyage! Smoked salmon seems to pop up everywhere these days, in all sorts of guises, but it wasn’t always the case. I had to reach the grand old age of twelve before relishing my first taste of this fine fish-lover’s fare. My mother and I had been upgraded to First Class (!!) 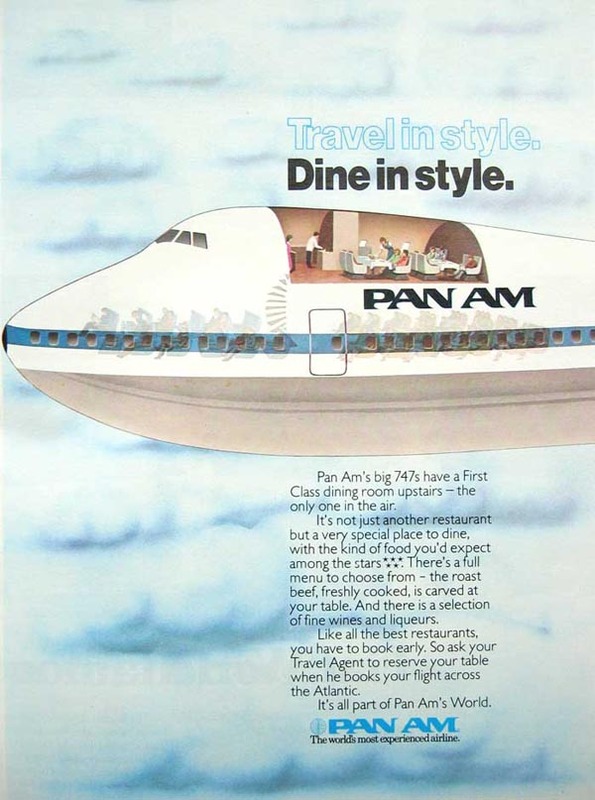 on a transatlantic Pan Am flight, in the good ole days of winged Clippers. The front of the plane was a new experience for my young self and I knew it wasn’t to be taken for granted, so I sat up straight and was on my absolutely best behaviour when the purser approached our row, what little there was of it. Before us she placed plates of cold fish in concertinas of tangerine, stark against the white crockery. I looked at my mother for guidance and she gave me a quick explanation of what we were about to eat. “It’s smoked salmon,” she explained, “and these are the condiments that go with it,” I looked down at the array set on the tray between us. Never had I seen fish served like this before. Little triangles of perfect Melba toast accompanied the spread, golden and warm from the galley. Just as I popped the first bite into my mouth, having had a quick lesson in what to do with the caviar and dollop of sour cream, the capers and tiny diced onions and morsels of hard-boiled egg, the purser returned. “Would the young lady care for vodka with that?” she asked my mother with a cheeky wink, “Vodka? ME?” I was confused by the offer, “but I’m only twelve years old!” I already knew that the American airlines were super-strict about the serving of alcohol to only those over twenty-one, not that I’d started hitting the hard stuff yet, so I thought we must have a real renegade in charge of our cabin. The purser continued to jest. “Twelve years old, huh? Funny. You look so grown up. I could swear you were at least twenty-one!” She knew just how to charm a shy adolescent. We returned home to New Zealand a couple of weeks later, my palate craving a food that would remain, for some time at least, reserved for special occasions. Following that landmark flight I had a new answer for people who asked what my favourite foods were: “Smoked salmon and caviar,” I’d reply, as if it were the most normal thing in the world. I had smoked salmon regularly as a kid: salmon around my hometown grew plentifully and many people smoked them. note: apologies for being so tardy in looking over here.